On a humid summer day in 2009, my mom and I walked around the American University campus for the first time. I had sent in my tuition deposit blindly and first saw the school when I came for summer orientation. After a few days of classes and activities, learning about being a new college student, I walked around our student union building, overwhelmed thinking about my future. I had never been away from home or my family in Buffalo longer than a week at a time. I didn’t know anyone at AU or even in DC. In that moment, walking among all the tables advertising the hundreds of student activities, I was scared and dreading coming back in a month to make this place my home. I remember choking back tears until we passed a table that said “Chi Alpha.” I very clearly remember almost walking past because I thought it was a fraternity. The man behind the table caught me and said, “We’re not a fraternity or sorority, but if you’re looking for brothers and sisters, we have them.” It was a corny exclamation, but that man became my campus pastor all throughout college. 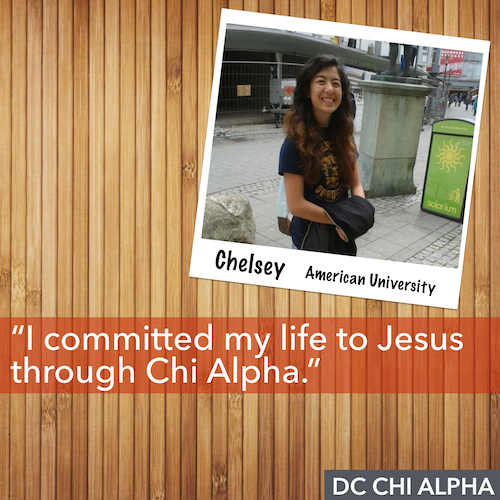 Chi Alpha became the community where I found life and joy and redefined my faith. It’s the place where I dove into deeper relationship with Jesus. It’s where I relearned who the Holy Spirit was and where I was encouraged to start leading worship. It’s where I went on a mission trip my freshman year that changed my life and led me to pursue vocational ministry after college. It’s the place that gave me friends and mentors who loved me, challenged me, and reminded me of God’s grace and goodness. It’s the community that helped me heal from past hurts and disappointments, and it gave me good, godly friends who will stay in my life forever. You see, I came to American University like most of the other students on my campus. I was focussed on success and pursuing everything I felt would make me great. My selfish ambitions were disguised by intellect and passion but left little room for Jesus to take control. With Chi Alpha, that changed. The coolest part is that I’m only one of hundreds of similar stories. The truth is, Chi Alpha changes lives. It tells college students that they’re worth something, that Jesus truly loves them. 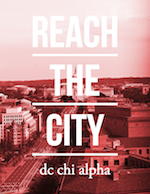 Where the church has trouble reaching college campuses, Chi Alpha has found a way to be relevant and impacting. In my time in college, I watched dozens of my friends get baptized, unchurched people decide to follow Jesus, and kids who grew up in the church rededicate their lives to Him. And these are all students who will go out and change the world. American University trains leaders and world-changers. We have future ambassadors and diplomats, Pulitzer Prize-winning journalists, businessmen, princes and princesses, presidents and senators. If Chi Alpha gets to reach these people and show them the love of Jesus, I’m in. If we reach them in the three to four years they’re in college, they can go out and reach the world, in places where I don’t have access to and can’t reach. I believe the college campus is the most strategic mission field there is. And if I can impact other students the way my life was impacted as a student, then I want to do that. That’s why I work for Chi Alpha.